Mark Guishard, program manager for the Risk Prediction Initiative (RPI) at BIOS, addresses the audience at Convergence 2017, an insurance-linked securities conference organized by ILS Bermuda and held at the Hamilton Princess (Bermuda) last October. During his presentation he spoke about the disastrous 2017 hurricane season in the context of individual impacts and climate change. And he’s not alone in this opinion. Many executives in the insurance and reinsurance industries are leaning in to the idea that long-term business models should include not just traditional actuarial sciences, but also climate sciences that can provide much-needed insight into future conditions that may impact insurance underwriting. To this end, reinsurance companies are beginning to hire ocean and climate scientists on their staff, and international industry conferences are increasingly placing scientists and science-based organizations, such as the National Oceanic and Atmospheric Administration (NOAA) and BIOS’s Risk Prediction Initiative (RPI) on their agendas. But this wasn’t always the case. Toward the close of the 20th century, concern about Earth’s changing climate was beginning to build. Countries around the world were starting to feel the impacts of climate change, with record-breaking droughts and extreme rainfall events impacting agriculture, causing property loss/damage, and prompting concern about long-term implications for world economies. The call for action on both national and international levels brought to light a growing need for complex, interdisciplinary climate science to be communicated clearly and efficiently, not just to governments and their citizenry, but also to the various industries addressing and impacted by a changing climate. In 1993, BIOS (then the Bermuda Biological Station for Research) was embarking on a strategic campaign to raise endowment funds and saw the chance to develop a new research and funding opportunity for the institution—one based on connecting climate research with issues of concern to the insurance and reinsurance industries. A year later, RPI was formed as a science-business partnership focusing on enhancing communication between scientists and decision makers in the insurance industry. 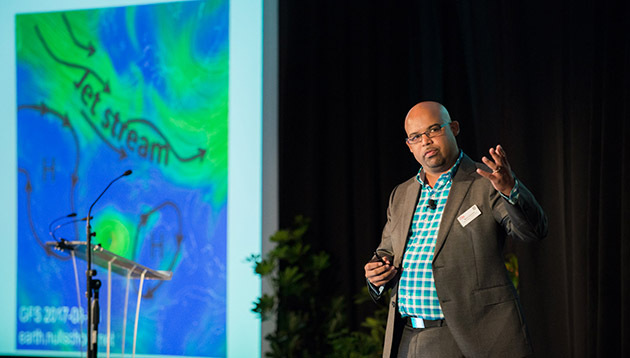 A Bermuda-based reinsurance company provided initial financial support and, within the first two years, an additional 13 reinsurance companies in Bermuda, the United States, and Europe signed on, with the goal of creating a new body of public knowledge on hurricane risks and climate variability. RPI offers opportunities for in-depth dialogue between scientists and reinsurers through a variety of topical seminars and workshops. In addition to the expertise of BIOS scientists, funding from member companies and industry partners allows RPI to enlist the participation of leading climate and hazard scientists from around the world. As a result, these workshops are an important venue for synthesizing details of independent scientific investigations, as well as identifying new directions for insurance-relevant climate research. The first workshop, held in 1995, discussed recent forecasting advances for the global climate cycle, while a second workshop held later that same year focused on hurricane prediction. Since then, workshops have been held every year, with topics including modeling and predicting storm surges, windfield dynamics of tropical cyclones, and European windstorms. Funding from member companies also allows RPI to provide research grants that support scientists and graduate students in climate science and the field of risk transfer. This not only helps direct academic research toward topics relevant to the insurance industry, but also promotes a new generation of individuals who aim to seek employment in risk management or contribute to the multiple fields of related research. Graduate students and early career interns also assist in the development of research that uses Bermuda as a disaster risk testbed, further strengthening BIOS’s support of the island’s disaster management community. In direct response to workshops and member communications, RPI has funded a wide range of research projects, both at BIOS and in collaboration with scientists at other institutions, with an eye toward translating research results into insights or tools that insurers can use in their decision-making processes. Over the years, this has resulted in a variety of resources: enhanced wind and pressure datasets for Atlantic hurricane historical records; a detailed analysis of the most damaging and deadly tornadoes in Europe; first-ever seasonal forecasts of hurricane strike probabilities along the U.S. and Caribbean coasts; and 1000-year proxy records (historical records gleaned from natural recorders of climate variability, such as ocean sediments and ice cores) of hurricane strikes on the U.S. Gulf and East coasts. RPI’s research doesn’t just benefit the insurance industry, either; earlier this year, the organization surpassed 150 scientific publications, ensuring that research results are available to both business and academia. Among these publications are papers in Nature, Science, Proceedings of the National Academy of Science, and other peer-reviewed journals; theses from graduate students that RPI has supported or mentored; and textbooks for risk management analysts. While the vast majority of RPI’s work has focused on tropical cyclones (including Atlantic hurricanes), this body of work has also advanced the fundamental science and understanding on a variety of catastrophic risk topics, such as flooding, extratropical (mid-latitude) storms, and tornadoes. In addition, RPI has helped pioneer the field of paleotempestology. This relatively new field uses geologic and historical documentary records—often dating back hundreds to thousands of years—to gain insight into severe hurricanes, storm surges, and tsunami impacts. Since its inception, RPI has become a model for the interaction between business and academia, demonstrating year after year the benefits of dialogue between reinsurers and climate scientists. In the last year, RPI had six member companies—XL Catlin, AIR Worldwide, Axis, RMS, State Farm, and Zurich Insurance Group, Ltd.—with additional support from BAS, Locus, and Polaris.